Allergies, bronchial inflammation, diabetes, frequent flu and colds, exhaustion and weakness, heart disease, high blood cholesterol, high blood pressure, infectious diseases, poor circulation and liver problems are some of the imbalances satisfied clients have used this product for. Qi tonic; to tonify jing, spleen and stomach; boost immunity. Active compounds include beta glucans, lentinan and the sterol eritadenine. Eritadenine and beta glucans both promote shiitake's strong cholesterol and triglyceride lowering effects. Lentinan has potent immune supporting effects. Other bioactive fractions have antibiotic, antiviral and immune stimulating properties. Beta glucans are large molecules that are water soluble polysaccharides. They have a unique branched shape that has special wellness benefits, especially those for the immune system. In the digestive tract beta glucans stimulate immune cells. Some beta glucans get absorbed undigested through pinocytosis to stimulate immunity throughout the body. People who have naturally low NK cell activity with general clinical symptoms of remittent fever and uncomfortable fatigue were also helped by lentinan (Aoki, 1987). Beta glucans as a type of soluble fiber can absorb cholesterol and toxins which makes them promote heart wellness. The beta glucan fiber may also help reduce risk for type 2 diabetes and help maintain better blood sugar control in diabetics. As a prebiotic supplement, Shiitake was also found to enhance levels of bifido-bacteria (Willis, 2007) in the body. Consuming whole Shiitake for 4 weeks resulted in many immune and anti-inflammatory benefits according to a clinical study. There was a doubling of Natural Killer (NK) T cells (important for immunity to cancer and viruses), more effective activation of receptors, improved gut immunity, and reduced C reactive inflammatory protein (CRP). This was measured as improved cell proliferation and activation and increased gut immunoglobulins (secretory IgA production) (Dai, 2015). In another study of those going through chemotherapy for breast and gastrointestinal cancers there was improved quality of life, NK cell activity, and reduced immuno-suppressive markers (Yamaguchi, 2011). The traditional dose of dried shiitake used as a food or beverage in soups, dishes, and teas is between 6 to 16 g. For serious complaints the dose of the dried mushroom has been 2 to 6 g per day. Lesser dosages of 0.5 to 1 g per day are used to manage chronic complaints. Oriental folk medicine uses shiitake to activate the blood. It is used for bronchial inflammation, colds, childhood measles, dropsy, fainting, headaches, mushroom poisoning and smallpox. 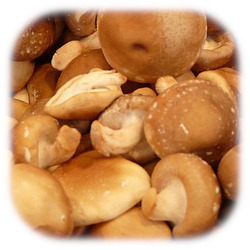 In Japan Shiitake as a tonic is used for allergies, constipation, double direction activity on blood pressure: lowering high blood pressure and raising low blood pressure, gout, hemorrhoids, improving complexion, improving vision, myopia, nerve pain, pyorrhea and as a jing tonic for sexual weakness. Japanese reports record mycelial extract being effective against allergies (including allergic asthma), autoimmune diseases such as purpura, cirrhosis, diabetes, hepatitis B, high blood pressure, leukemia, liver infection, low blood pressure and stomach ulcers. In China during the Ming Dynasty Shiitake was used as a jing tonic to increase sexual and vital qi. Some of this information on Shiitake mushroom benefits is excerpted and adapted from "Shiitake the Healing Mushroom" by Kenneth Jones.